Looking after the aged or the elderly has become a primary concern nowadays. With a hectic schedule, a busy job, and thousands of other little things to take care of at home, taking care of a senior citizen can be a challenge. That is why you must opt for the experienced and well-trained caregivers who can take care of your aged family members. 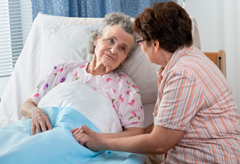 We, at Bayshore Home Care, can help in home care. We are a premium level home health care center which has been in this business since 1986. We have an expert team of nurses or caregivers which can be customized to specially provide you with the sort of assistance you require, tailored to your needs. So, if you belong to areas such as Clearwater, Hillsborough County, Pasco County, Pinellas County, St Petersburg, or Tampa, you can resort to us without any further delay. However, before taking a decision regarding which company you should choose for your home care services, you must check a few things. Here, we have discussed a few of them. Take a look. In order to understand if the company is an experienced one and can be trusted or not, you should check the license and insurance information of the company. Otherwise, if anything goes wrong, you might face a lot of troubles. So, check if they are registered with the Health Care Administration and follow their set guidelines or not. Budget is crucial to every kind of expense. Hence, if you are planning to invest on home care services for the elderly in your family, you need to also decide on the budget. Take free quotes in advance from several companies to compare their rates in order to make the right choice. So, check if the company you are considering also provides a free quote facility or not.